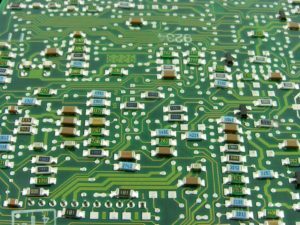 Precision Technology, Inc (PTI) is one of the premier manufacturers of custom printed circuit boards in the intermountain west. Since it began operations in Salt Lake City in 1968, it has continued to expand both its technology and customer base. Our customer base includes OEM and contract manufacturers. Together, they represent a wide variety of industries to include science, research, medicine, defense, and development. PTI employs about 45 highly trained engineers, managers, technicians, production workers and sales/customer service personnel. The company has earned a reputation for producing very high quality custom-built printed circuit boards that are delivered on time and within purchase specifications. It specializes in prototype to mid-production quantity runs from double-sided to twelve-layer technology. We have over 580 combined years’ worth of experience with our average tenure being over 13 years. We leverage our experience to provide quality products. PTI is especially proud for being in business for over 50 years! In today’s business climate, that type of longevity clearly indicates a well-directed and motivated company. Since 1979, PTI has been under the ownership and direct management of Robert Jones, a lifetime veteran of the PCB manufacturing industry. Bob and his core group of managers have a finely-tuned, mature business operation. The manufacturing processes are well developed and documented. The shop is equipped to handle the demands of todays sophisticated technology. PTI understands the importance of consistently providing high quality, dependable lead times and responsive service to meet their customer’s needs.